We are learning foundation piecing (also called paper piecing) using a pattern called New York Compass. 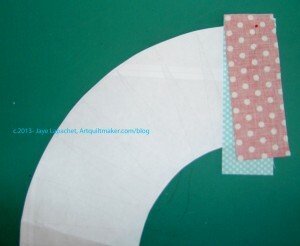 If you are just finding this tutorial, go to part 1 to see the supply list and learn how to prepare your pieces. 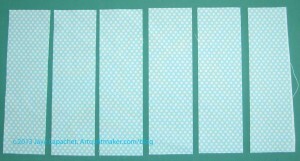 I am using an aqua with white dots for my background and a red with white dots for my foreground. You should have already cut your rectangles for both foreground and background at 2.5″x6″. If not, do it now, as you will need them almost immediately. The sections of Section C are marked in the order in which you should piece them. Start with C1. 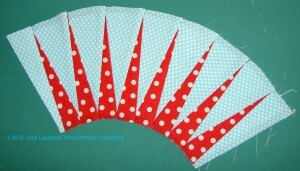 Odd numbers are the background and even numbers indicate you should use the foreground (spikes) fabric. You will be piecing from one side (C1) towards the middle to the other side, ending with C17. 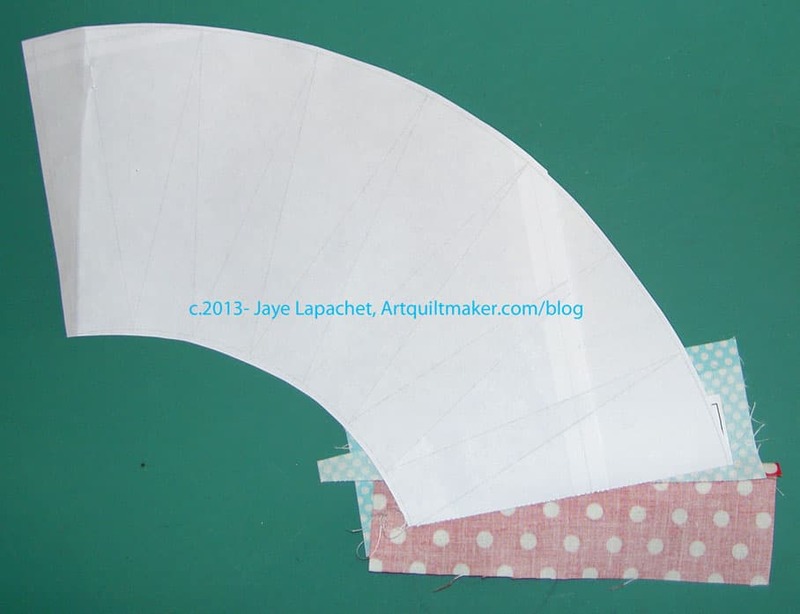 Set up your sewing machine with an applique’ foot or similar. You will not need your quarter inch foot for the foundation piecing part of the process. Shorten the stitch length. If you can’t shorten the stitch length, remember to backstitch at the beginning and end of each line of stitching. If you are a speed demon, and the option is available on your machine, slow down your machine a little bit. You will need to control the speed at the beginning and the end of the stitching lines. Place your Section C pattern face down on a flat surface. Cover piece C1 on the paper pattern with one of the background rectangles you cut in Part 1. Place the fabric in such a way to leave at least 1/4″ of fabric around each piece. You get extra bonus points if you line one long straight edge with the straight line at the end of the pattern. Now, hold the pattern and the foreground fabric in one hand (optionally you can clip them together with a WonderClip) and hold the whole piece up to the light (facing a window or a lamp or on a light box). Take note of where the line is between C1 and C2. Still holding your pieces up to the light, take one of your foreground rectangles and place one of its edges 1/4″ from the line between C1 and C2. This will be the seam allowance and that quarter inch should hang over the line into C2. Put all the pieces carefully back down on your table. Pin the two fabrics to the paper, keeping the pin well away from the line between C1 and C2. 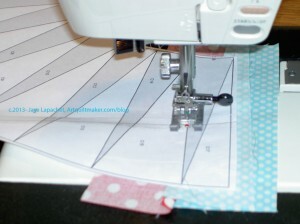 You want enough space so the pin doesn’t interfere with the foot on your sewing machine. I also like to pin parallel to the sewing line and within the seam allowance to so I can test to see if the fabric covers the other pieces. I like to pin on my cutting mat so I don’t damage the furniture. Fold the foreground piece back to make sure that it covers C2. You will fold it on the line between C1 and C2. That will be your sewing line. You can move the pins to the front for easier sewing. Flip the whole thing over and take a look. Once pinned, check again to make sure that you have at least 1/4″ all around C1 (background) and C2 (foreground). Take your piece to the sewing machine and sew on the line between C1 and C2. Do not go over. Only sew on that line. Back stitch at the beginning and the end. One backstitch is fine. Remove the piece from under the presser foot and fold your foreground over to check and make sure it covered C2. You might need to hold it up to the light. You can see the foreground fabric through the background, which is why you need to trim. 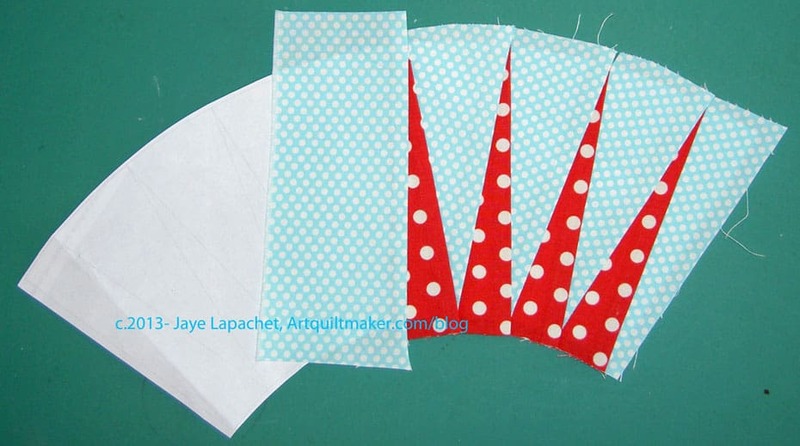 Depending on the colors you use, this may not be the case, but you don’t want to build up so many layers that you cannot quilt through the piece. 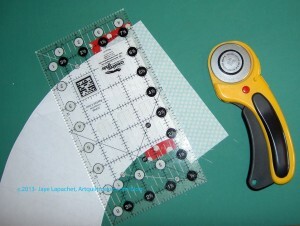 Take Section C back to your cutting mat and place it so the paper part of the pattern is on top. 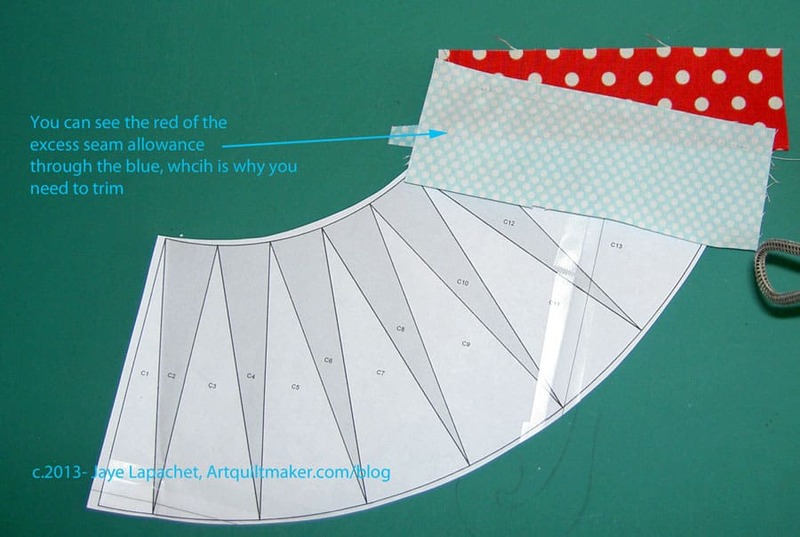 Fold the paper back on the seam line so the excess seam allowance is exposed. 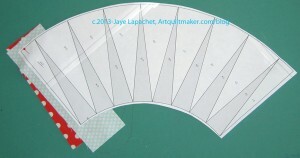 You are going to cut this off, so it is worthwhile to take a minute and make sure you are not cutting off the wrong part, eg the part you need to cover your background and spikes. 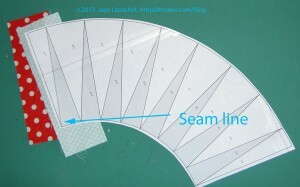 Line up your ruler with the 1/4″ line on the seam line and trim the excess seam allowance. 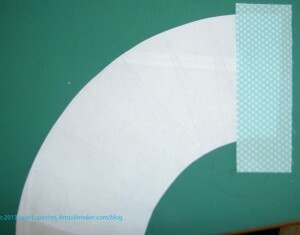 Take your piece to your ironing surface and place it with the paper down. Press towards the foreground, so you get rid of as much of the “bump'” from the seam as you can. 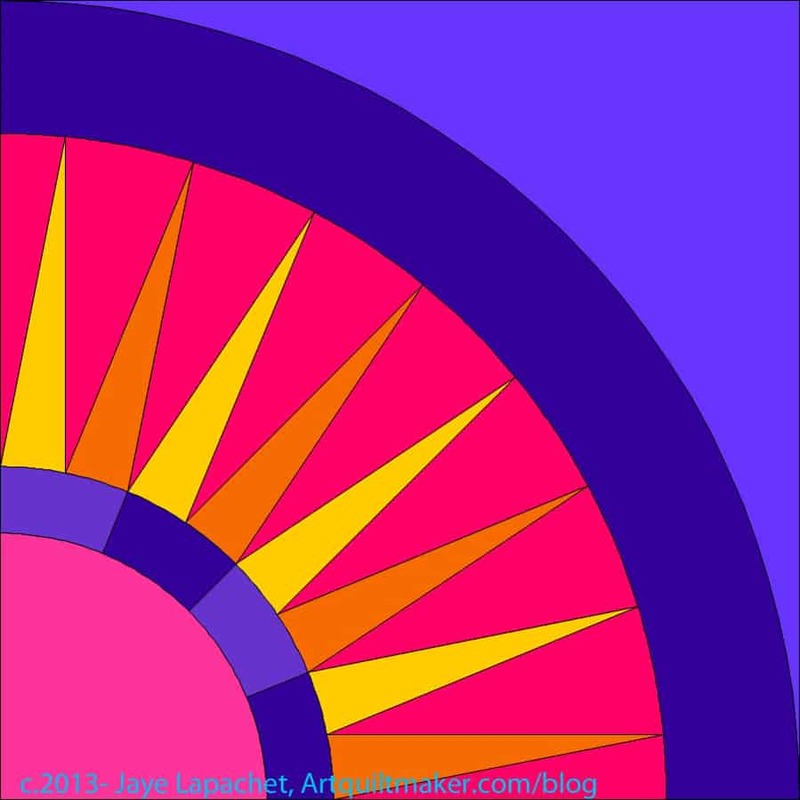 Press towards the middle of your pattern. You want the foreground fabric to be as flat as you can get it. Pressing is very important. It is possible that there will be a bump when you put the next piece over the previous one, if you don’t press well. 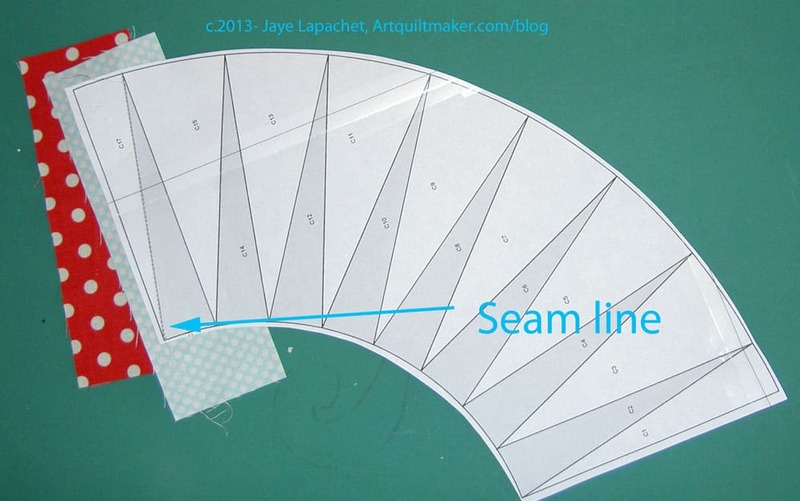 Your foreground piece should cover the line between C2 and C3 and give you a 1/4″ seam allowance. Once you have pressed the foreground flat, you are ready to put on the next background piece. 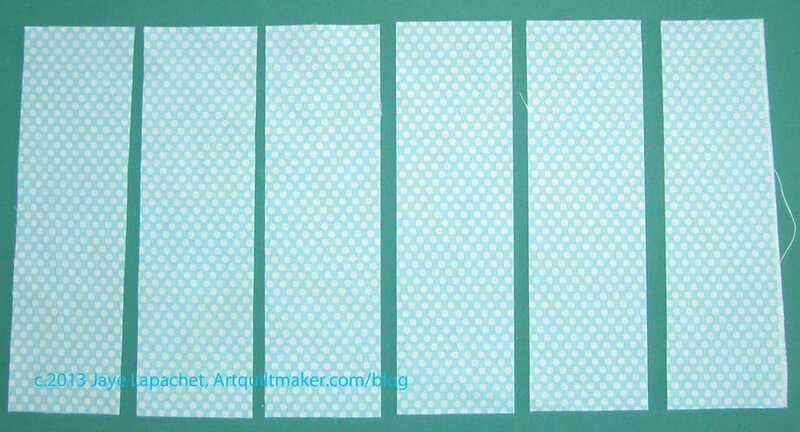 Take one of your background rectangles and place one of its edges 1/4″ from the line between C2 and C3, smoothing (without stretching) the foreground piece you sewed, so it is as flat as possible. 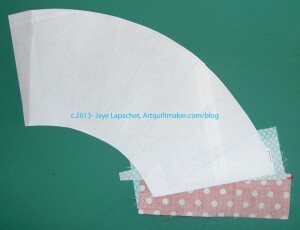 Again, this will be the seam allowance and that quarter inch should hang over the line into section C3. You may need to hold it up to the light again to position the piece correctly. Once you have the correct placement, pin in place. 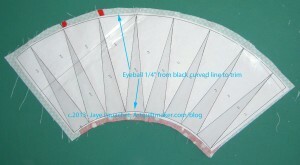 Once pinned, check again to make sure that you have at least 1/4″ all around C2 (background) . Take your piece to the sewing machine and sew on the line between C2 and C3. Do not sew beyond the end of that line. Only sew on that line. Repeat this process, alternating between foreground and background until you reach the other end of Section C. As you move down the pattern, your Section C will start to look like something you could put into a block. Use your rotary cutting kit to trim the straight edges of Section C.
From the paper pattern side of Section C, I eyeball a 1/4″ and trim the curves with very sharp scissors. There are some serious layers here, so I am not fooling when I say sharp. The finished Section C is a sight to behold. Even after making several of these sections, I amazed each time it turns out. If you have to rip out stitches, rip them out from the fabric side, not the paper side. Pay attention to putting the next piece on the foundation.